5.06 points at 16 votes (rank 767). 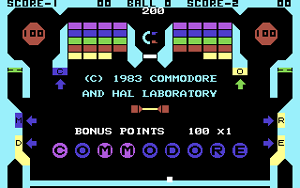 "Pinball Spectacular" is one of the first flipper simulations for the Commodore home computer C64 and VC20. The game was delivered on cartridge. A speciality is the controls by paddle, which is done in port #1. If no game is played, a demo is shown. 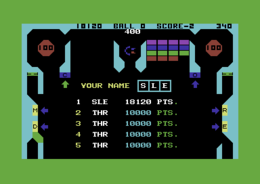 The flipper simulation is a mixture of pinball and breakout. The square-cut ball is rolled over the pinball table with the help of a double board similar to Breakout. 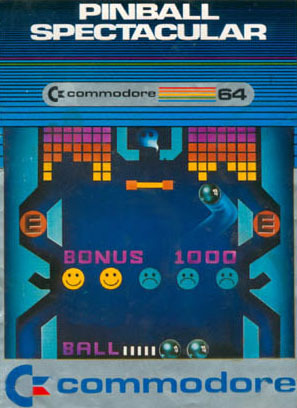 As pinball elements, there are -next to walls- also two bumpers (upper right and left), the Commodore logo (in the middle of the screen), the light C O M M O D O R E with the corresponding targets, two spinners, four sideways ball traps (middle and bottom) and a point display. Furthermore, there is a time-sensitive ball barrier to avoid the ball going into out. 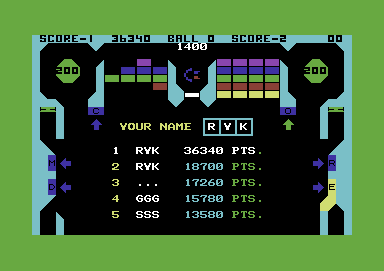 The overview line with ball display, active player and points is in the first line of the screen. You have 3 balls per game. There is only one "table", no scrolling and scarce animations. The coloured graphics consist of graphic signs and some sprites. Except for some sound effects there is no background music. The control by paddles is well-done and exact. The "flippers" are moved into the corresponding direction by turning the paddles to the left or right. To start the game press the fire button. To choose one or two players turn the paddle anti-clockwise for one player and clockwise for two players until the corresponding message appears. After that press the fire button. To get a new ball into the game, press the fire button. After the game you can enter your initials into the highscore list (if you have a high enough score). The letters are chosen by turning the paddles and confirming with fire button. An erased line of blocks raises the bonus. If Commodore is lit, the bonus is x5. There is an extra ball when hitting the lit spinner. If the ball is shot through the spinner, it loses speed. 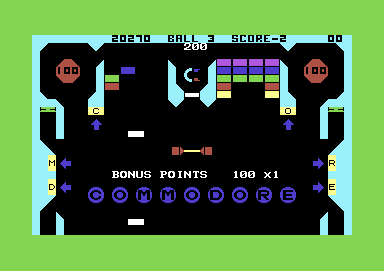 If the "flipper" is placed between the R and the E of COMMODORE at the time when you bring a new ball into the game, the ball will fly into the "side bag" and raise the bumper bonus of the right bumper by 100. The version by "Remember" and "Nostalgia" offers next to cheats also the manual, a saveable highscore list and the control by joystick. The paddle should always be preferred to the joystick. 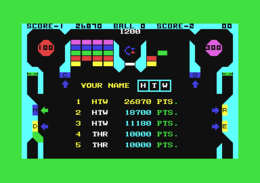 H.T.W: "Well, the game is not really spectacular on an emulator, but played with Breadbox and paddle on an old CRT-TV this looks totally different. The coloured blocky outfit and the sounds calling up memories, together with the direct but a bit shaky controls of the "board" with a paddle let one pass some time with this game. No game for emulators (if any, then the CCS64 with mouse) but on the original hardware quite well playable." TheRyk: "From today's perspective, the game has at best a spectacularly square ball. Even back in 1983, the game was nothing special and probably no serious competitor for the games David's Midnight Magic and Night Mission Pinball, the genre-dominating releases from the same year. The idea of the double bat which can optionally be used as a multiplayer mode deserves as well to be appreciated as the combination of flipper and breakout elements. For such an old game good average, 5 points. PS: In my opinion it is also playable on VICE if you use a defined keyset as joystick." This page was last modified on 28 November 2014, at 01:02. This page has been accessed 6,757 times.